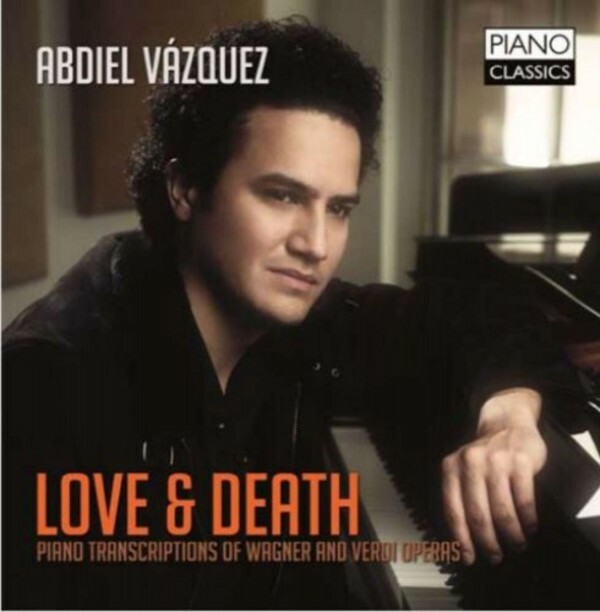 These rarely heard piano transcriptions of Wagner and Verdi operas share a common theme: Love and Death, the two most important themes of opera, as a reflection of human life and fate. First the pianist Abdiel Vazquez presents his own 'Meistersinger Rhapsody', a stunning pianistic tour de force. The three Wagner transcriptions (Ride of the Valkyries, Siegmund�s Love Song, Love Scene and Transfiguration from Tristan) are by Carl Tausig, Liszt�s favourite pupil, an awesome pianist and composer who died tragically young. The Concert Fantasy over themes from La Forza del Destino is by Italian composer Giuseppe Martucci (a wonderful composer with a fine ear for instrumental colours), followed by two famous paraphrases by Liszt (Rigoletto, Aida). The disc finds a spectacular conclusion in the fiendishly difficult Trovatore Paraphrase by Gy�rgy Cziffra. Abdiel Vazquez is one of the foremost pianists of Mexico, and a first Prize Winner of the New York Shining Stars Debut Series, which brought him his Carnegie Hall debut. He presently lives in New York.